I have the wheels, all the parts so i need the body i have the old one and its so banged up the wheels wont turn. So if someone has one for sale let me know. Can anyone tell me if the 921 diebold safe lock is the same as the 900 series. I'm not familiar with that one, so I don't imagine I have what you need. Maybe posting some photos will help others find what you're after. Please post pic of the 'lever'. Come on no one or even a idea to where i might find one. I used that old body, but I I'm still interested in buying a better on. Hi Al: I have several extra Diebold locks but they say 177-23 on the cover. Cases look the same though. John. I will get them posted this evening, four hour time difference. 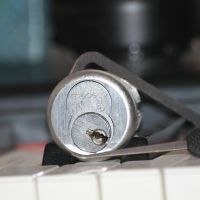 Here are pictures of two locks with an attempt at measuring , hope these will work for you! Mine is 3" 1/4 long 2" 3/8 rall 1" wide mabey someone with more experience can let me know if that's close enough it looks just a little off it might work. I got faith that someone will know. castagnojohn wrote: Here are pictures of two locks with an attempt at measuring , hope these will work for you! I want to thank you and when i get the lock together I will post it again thank you for helping and taking time to answer there are some really good people here.